All the hard work of the Northeast Region paid off in the fantastic 142nd National Grange Convention in Cromwell. I have received much praise from those who attended as to the way the session was held. I was but a small part of the entire show and the number of persons who truly deserve the praise are all of you who helped out. I believe all who attended really enjoyed themselves. We put our best foot forward. Now that it’s over we enjoyed a short breather. Very short. On the 22nd of November I held the Pink Sash meeting. All the committees met and planned their programs for the coming year. I met with the Deputies and we worked out our plans for the year. Grange evaluations and Pomona inspections will be the same as last year. The Deputies are planning for the schools of instruction for the early part of 2009. They will be informational and problems and concerns will be discussed. Many of you asked to have the floor work demonstrated and it will be done at the request of each Pomona. I do hope that many more will attend one of the schools because they are informational and important procedures are discussed. Your Deputy will be contacting your Grange with information on the school for your Pomona. Those of you that did not get the word will find a list of the schools that were set up in time to make this edition. The second weekend in January Sister Marge and I along with all of the committee directors will be off to Fitchburg, Mass. for the Northeast Leader’s Conference. There we will meet with the leaders of the other six states in our region to discuss plans and programs to grow the Grange in our region. We will also attend workshops to develop our leadership skills. All of this training along with the schools of instruction are for the benefit of all the members and hopefully will produce new leaders in our Order. 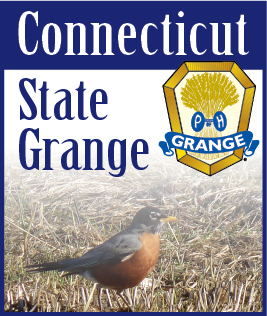 I know that over the holidays many of us were very busy but now that we are into the new year, I hope you will do your part to improve the Grange by visiting other Granges in your area and lending a hand at those Granges that need a little help. It’s time to be neighborly. I know that now, we are facing uncertain times but I truly hope that this New Year will be prosperous for all of us.